Based on the 1973 musical stage production “The Rocky Horror Show,” the film centers on newly engaged couple Brad Majors and Janet Weiss, who find themselves lost somewhere near Denton, Texas, with a flat tire on a gloomy November evening. Seeking a telephone, the couple discovers the eerie mansion of Dr. Frank-N-Furter, a transvestite scientist, where they meet a group of strange and outlandish people, including servants Riff Raff, his sister Magenta and a groupie named Columbia. What ensues is something straight out of the books of science fiction and horror, but funnier. Costumes, makeup and cosplay are welcome and encouraged for this event. There will be an opportunity, arranged by COMD, to attend a Rocky Horror Picture–themed makeup workshop by award winner Aziza Abdieva before the screening (5:40-7:30 p.m., in the Faculty of Music and Performing Arts building). Limited places are available; for registration, contact aziza.abdieva@ug.bilkent.edu.tr. For this special event, the student club Think Colorfully will join Bilkent Cinematics in introducing the film. 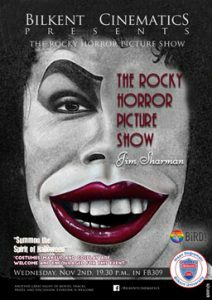 “The Rocky Horror Picture Show” screens on Friday, November 2, at 7:30 p.m., in FB309. As with all Cinematics film screenings, the movie will be shown in its original language (English), with English subtitles; everyone is welcome to attend, and snacks and beverages will be served.